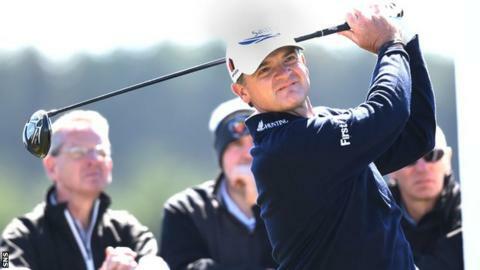 Paul Lawrie has expressed his dismay at not being chosen as a vice captain for the Ryder Cup team at Gleneagles. The Scot was part of Europe's victory in Medinah two years ago and had been tipped for a role. Instead, Jose Maria Olazabal, Padraig Harrington and Miguel Angel Jimenez will join Sam Torrance and Des Smyth. "Extremely disappointed not to be involved at Ryder Cup but all the best to all of the European team," Lawrie posted on social media. On Tuesday, Europe's Ryder Cup captain Paul McGinley selected Stephen Gallacher, Ian Poulter and Lee Westwood as his wildcard picks for the match against the USA later this month, then announced Harrington, Olazabal and Jimenez as his remaining vice-captains. Lawrie, 45, won the Open in 1999 and was part of the winning team at the Ryder Cup in Medinah when Europe achieved a memorable comeback by winning eight and tying one of the 12 singles matches on the final day. However, he suffered a drop in form this season, but was still being tipped to land a vice captain slot at Gleneagles. At the 2010 Ryder Cup at Celtic Manor, there were five vice captains under Colin Montgomerie - which the European team won to regain the trophy. Olazabal was captain of the European team that came from 10-6 down on the final day to beat the United States in Medinah in 2012, and has played in the competition on seven occasions. The upcoming event will be the Spaniard's third Ryder Cup as a vice captain. Captain McGinley justified his vice-captain selections on Wednesday. "I know it's been common in the past to have three or four vice captains," said McGinley. "But I've gone for five because I feel an extra person is justified due to the additional workload which comes from being the home team,'' McGinley said in a European Tour statement. Jimenez also has been vice captain twice before, in 1997 and 2012. Harrington has played in six Ryder Cups but has never been a vice captain. McGinley added: "They will all bring valuable insight and experience to the players and the team room." The Ryder Cup in Gleneagles, Scotland takes place from 26-28 September, with Europe seeking an eighth win in 10 competitions.